Pantry and clothes moths are destructive pests that easily spread wreak havoc on an unsuspecting pantry or cupboard and closet. they love your cereals, grains, flours, dried fruit, herbs, dried mushrooms, pasta, chocolate, nuts, powdered milk, pet food, bird seed and expensive cotton fabric. pantry and clothes moth infestations are frustrating. Ephestia elutella and Tineola bisselliella are often encountered in life. Ephestia elutella, the cacao moth, tobacco moth or warehouse moth, pantry moth, Indian moth, food moth is a small moth of the family Pyralidae. It is probably native to in Europe, but has been transported widely, even to Australia. A subspecies is E. e. pterogrisella. Tineola bisselliella, known as the common clothes moth, webbing clothes moth, or simply clothing moth, is a species of fungus moth (family Tineidae, subfamily Tineinae).It is the type species of its genus Tineola. PTCLTRAPS8 Moth Traps is the perfect solution. They use the strongest attractant and the stickiest glue, drawing in the males and stopping the breeding. Pantry and clothes moth traps work immediately and effectively: a pheromone attracts the male moths, which are caught on the trap's glue, thereby preventing the moths from mating and reproducing. pantry and clothes moth traps are non-toxic, making them the perfect solution for rooms and cupboards and even boxes with food. they are designed for maximum airflow to en sure they are as effective as possible. the discreet design easily blends into your home. Keep away from children and pets. store traps in a dry and cool place. use vegetable oil to remove any glue you may come in contact with. 100% refund your money if you are not satisfied with the product, no risk to you. 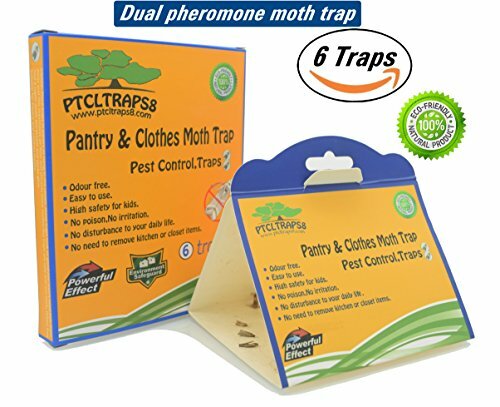 POWERFUL DUAL PREMIUM PHEROMONE: We use the Clothes and Pantry dual premium pheromone produced in the United States, The largest range of coverage of common moths in American family. Captures the male moth by releasing a natural dual premium pheromone attractant, which leads to the female will not be fertilized and no further eggs will be laid. Moth traps are catch a variety of male moths to break the moth breeding cycle. ODOR-FREE & NATURAL AND SAFE: For the health of your family, please give up the harmful and inferior moth traps and moth balls,Dangerous chemical products have a lot of potential damage to your body. Our made in USA natural dual moth traps closet clothing pheromones provide 100% SAFE PROTECTION, WITHOUT stinking up your favorite sweaters! For about $30, you get SECURITY! LONG-LASTING PROTECTION: We installed the pheromone in the hose to make it last longer.Three months of product life after opening the aluminum platinum bag and tearing the protective paper. High safety for kids and pet, No need to remove kitchen or closet items. If you have any questions about this product by PTCLTRAPS8, contact us by completing and submitting the form below. If you are looking for a specif part number, please include it with your message.